YI Lite, for Young Innovators. Turn cherished moments, into clear memories. Whether you're at a family barbecue, or at a festival with friends, the SONY IMX206 image sensor can record each moment in full 1080p HD, and capture 16MP photos. Turn those cherished moments into clear, crisp memories. Hisilicon Hi3556 Chipset Stay cool and don't overheat. Say "Hi" to the newest Hisilicon Hi3556 chipset; its complex structure teamed with its powerful configuration allows the YI Lite to efficiently record HD videos without overheating, even in warm environments. Stay cool and keep shooting! Customized with high resolution and high sensitivity touchscreen for an intuitive experience. An integrated 2" Gorilla Glass LCD screen, resists scratches and daily impact, and is viewable from a 150° angle. With YI Lite Action Camera, you can avoid extra time spent editing due to the camera's EIS feature, which uses built-in gyroscope and accelerometer sensor to detect position and motion change. 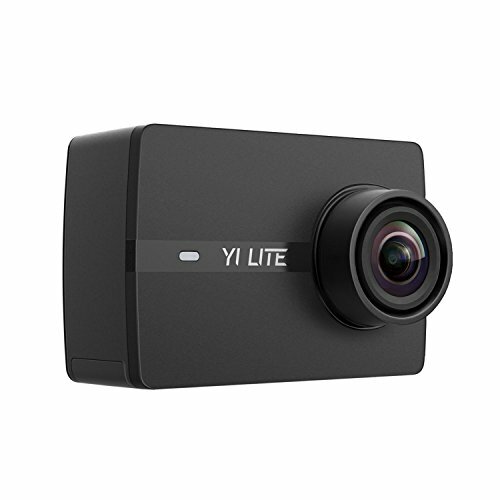 YI Lite Action Camera allows you to manually set IQ parameters such as Shutter, Exposure Value Compensation (EV), Level Sensitivity (ISO), Metering Mode, White Balance (WB) and more. Choose between 9 shooting modes. Achieve your potential and create professional work. NOTE: Micro SD Card is not Included. If you have any questions about this product by YI, contact us by completing and submitting the form below. If you are looking for a specif part number, please include it with your message.